Earlier this month I was fortunate enough to spend a full day in the trenches, so to speak, riding along with founder Cathy Snyder on the Rolling Harvest Food Rescue van. This is a vehicle that is clearly put to good use in the fight against hunger. 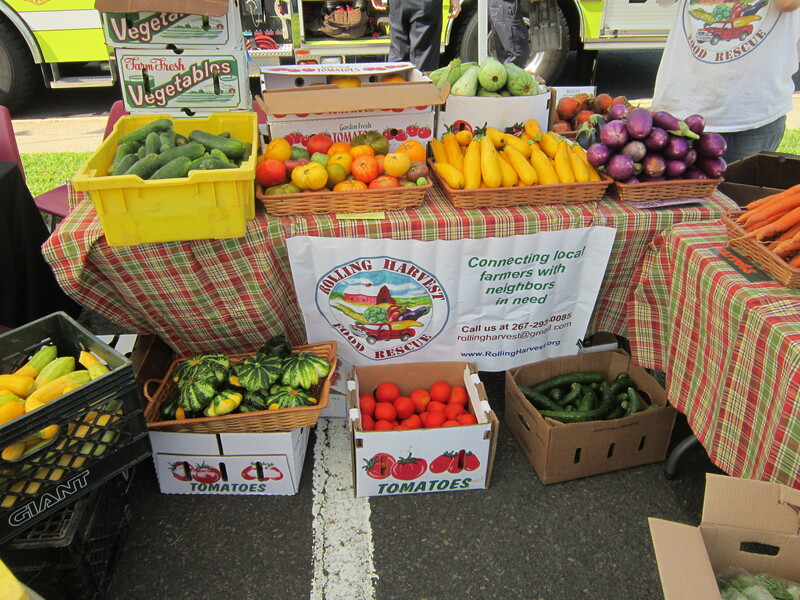 Rolling Harvest Food Rescue collects donated produce from farmers in the southeastern PA & central NJ region and redistributes that food to multiple relief organizations serving the hungry; especially those who struggle to obtain high-quality, nutritious fruits and vegetables. In short, Rolling Harvest is the critical bridge between local famers with excess food and local people in need. Cathy’s efforts reflect several of the essential aspects to making food recovery programs successful — relationships, efficient logistics, and a sense of community. Since founding Rolling Harvest in 2009, Cathy has forged strong relationships with local farmers leading to a continual stream of nutritious food donations throughout each growing season. The strength of those relationships is quite visible when the RHFR van stops for a pick-up at a donor farm and multiple hugs are exchanged with staff members. Cathy maintains those relationships through timely communication and highly efficient logistics. Farmers come first. Pick-ups are scheduled when convenient for the participating farmers, and they are made on time to avoid any disruption to their busy schedules — for nothing sinks a food recovery program faster than unreliability. Cathy contacts farmers and relief agencies in between stops and provides highly accurate pick-up and delivery windows. Pick-ups are balanced with deliveries over an organized route, thus optimizing the use of the organization’s single van and creating “efficient scale.” Relief agencies can often choose fresh produce items that were picked up within the last hour. A strong sense of community permeates the entire process. Donations are gratefully acknowledged by Rolling Harvest at each pick-up point, and although they don’t get the chance to witness it, farmers are informed of the impact that their donations have had on needy families at distribution events. They clearly know that their food is serving a great cause. In his book Ending Hunger Worldwide, author George Kent notes that caring communities are key to ending hunger. Cathy’s partnerships with farmers exemplify the power of that sense of community. The main beneficiaries of Rolling Harvest’s work are, of course, the recipients of the fresh produce that is collected — many of whom rarely have access to the nutritious, fresh produce that they so desperately need. One of the most impressive aspects of this work occurs at distribution. After storing a large quantity of the day’s pick-ups overnight in a cooler, Cathy and Rolling Harvest took the time to emulate a rural farmers’ market in an urban area the following morning. Recipients were able to choose from a great variety of fresh produce including carrots, squash, zucchini, cucumbers, sweet corn, arugula, tomatoes, eggplant, garlic, cantaloupe, hot peppers, beets, broccoli, heirloom tomatoes — all of it fresh, and much of it organic. Coupled with educational messaging on nutrition, such events provide great benefit to food insecure individuals and lay the seeds for healthier living. They also promote that critical sense of community — and hope. Donors on this particular day included Tinicum CSA, Sandbrook Meadow Farm, Zone 7, Blue Moon Acres, and Double Brook Farm. Donating farmers benefit from a reliable outlet when supply and demand conditions result in excess supply. Costs associated with waste are avoided. They gain satisfaction knowing that the crops that they worked so hard to produce are helping those in need rather than going to waste. They also benefit from an energized workforce that is inspired by food redistribution efforts that do so much good. Relationships. Efficient Logistics. Caring. Community. All of these themes stand out in the work driven by Cathy and Rolling Harvest Food Rescue. The benefits are clear every step of the way, from humble donors to inspired volunteers to grateful recipients. Next Next post: What If Apple Changed The Food System?